In the last year I have got to know 2 master ice cream makers, both Italian, who are making a name for themselves in the world of gelato. Interestingly enough, neither of them lives and works in Italy for they have found a demand for their specialist skills outside their home country. One is Gino Soldan, the master gelatiere in charge of the very special Harrod's ice cream parlour in London (Morelli's Gelato). Gino hit the headlines in the summer of 2008 because of the unusual ice cream he was making for a special, sponsored and limited edition of ice creams. These included an incredible array including wensleydale cheese ice cream. Wallace & Gromit fans will recognise Wensleydale as being Wallace's favourite! The other is Marina who lives and works in Barcelona. Having run her own, very popular ice cream parlor in the city she recently told me about her latest venture - her ice cream school. It was fascinating to learn what gave her the idea and who her students are. Although I haven't tasted her ice cream (not having been to Barcelona yet unfortunately! ), the photographs of her stracciatella ice cream and her fig ice cream are sufficient to make you believe that she is a lady who knows her gelato! 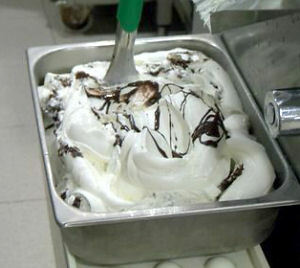 Here is a freshly made batch of her stracciatella gelato. If, however, you cannot get to her ice cream school - and that will apply to many of you of course - then you can always have a go at making gelato yourself. Here is my gelato recipes page. Enjoy!